Rebuilt Book Club - Spring Reboot! 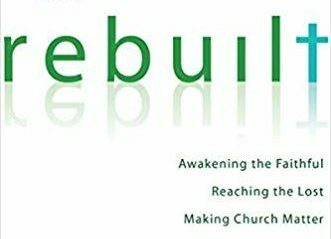 Rebuilt: Awakening the Faithful, Reaching the Lost, and Making Church Matter is the story of the Church of Nativity. A Catholic Parish in Timonium Maryland. The Book was written by Fr Michael White and Tom Corcoran follows their journey from a ‘maintenance’ focused parish in steady decline to one of the most vibrant, healthy, growing parishes in North America. Join Us as we Run the BookClub Again! January and February 2019, Holy Family held our Rebuilt Book Club – and the response was incredible! Over 300 parishioners read the book, then met for 6 weekly sessions to discuss, reflect, and discern how we can take inspiration from their story, for our Parish Mission: love God, love others, make disciples. If you were unable to participate at that time, or if you would like to do it again – please join us as we run the Book Club again! The Book Club will run on Tuesday Evenings at 7pm starting May 7th for 6 weeks. Audiobook version of Rebuilt is available at audible.ca. It can either be purchased (currently $14.95), or if you are not already a member of audible.ca – you can set up a free 30 day trial period, and receive the audiobook for free. If you cancel your membership before the end of the 30 day trial period, you should not be charged, and you still get to keep your audiobook. After purchasing / receiving as part of the free trial, you can download the audiobook to your devices and listen while you drive, work or relax. • Download the “online participant guides” below (a new one will be added each week) and follow the instructions. • When you’re ready – watch the video (at the bottom of this page – a new one will be added each week), then continue working through the online participant guide). • Send us your thoughts, questions and feedback! Use these only if you are attending the book club at Holy Family, but need to access the resources. Watch the Rebuilt Message Series and follow along with the online participant guides of the Rebuilt Book Club! What is the Rebuilt Book Club all about? Week 1: Do We Know Our Why? Week 2: Do We Put Our Faith and Trust In God? Week 3: Can We Change Our Church Culture? Week 4: Where Is God Calling Me To Serve? Week 5: Are You Ready? Week 6: Are you on the lookout for something new from God? Do We Know Our Why? You may wonder why Holy Family is doing this “Book Club”. There is increasing awareness within the wider church about the disconnect of people from the church. Even here at Holy Family we see this. We hear from people who are concerned for the church, who are concerned for their family members and friends who no longer participate in their faith, or even rely on their faith in their life. We also hear from people who are struggling themselves with feeling connected with the church and their faith. You may have heard Fr. László or Fr. Matthew ask us the question, “Why do you come to church?”. Well, why? While the Book Club study of “Rebuilt: The Story of a Catholic Church” is about engaging more parishioners in the process of looking at our church and how to create a stronger and even more vibrant community, it really is more about helping us all individually and collectively find our way in our mission. In the first week of our Book Club, about 300 people came together in the 4 different sessions to watch a video of Fr. Michael (one of the authors of “Rebuilt”), participate in small group discussions and consider their own “call to action” for faith. It is important to realize that our mission is biblical, and each of the videos from Fr. 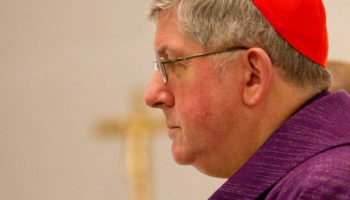 Michael is also biblical – they are his homilies to his parish based on the Gospel and connecting the Word of God to the life and times of his people. In the first video, he speaks about the temptation of Jesus by the devil (Luke 4: 1-12). Each time, Jesus responds with scripture and resists the temptation. Fr. Michael talks about this being the temptation to short cuts, about avoiding the hard work. The temptation to Jesus was to forget about the cross, but he couldn't forget about the cross because that is why he came, it is his "why"! What is our why? Are we being distracted from our true purpose by things which are out of alignment or even in direct contradiction to our mission? Are we seeking the safe, comfortable satisfaction that comes from maintaining the status quo? Are we being tempted to spend our time on things which seem easier or more rewarding than what we should really be doing as followers of Christ? In the first book club sessions, the thoughts of our participants were very clear: many share concerns about family members and friends who are no longer active in their faith; many are seeking to grow closer to God themselves; so many want to discern how they can help support bringing others back into relationship with God and their faith. You also heard in Fr. László’s homily on Sunday that our church exists in a consumer culture that is contrary to our mission, and which has particularly pushed away our young people. Trying to respond to these concerns is what makes church matter, when it means enough personally to each person that they engage in conversation about it and then take action because they do see it as their mission. They know that church is not just a building we go to, but “church” is the body of Jesus on earth, and we ARE the many parts of that body called to continue His work for the sake of those we love and a whole and healthy world. Please join us in our mission! Do We Put Our Faith and Trust In God? Do you remember the story of Abraham? In Genesis 15, as he and his wife are aging, he despairs that he has no heir. God has taken Abraham out of his own country, promised him and his people a new land, and he has promised him a son. Time and again, Abraham and Sarah face struggles, challenges, and doubts about what God has asked them to do. Then the bible passage tells us that the Lord takes Abraham outside to count the stars in the sky and says that his descendants will outnumber the stars! What we do not realize until later in the story is that when he does this, it is actually during the day, and so Abraham cannot see the stars… The point is that though he cannot see them, Abraham knows they are there, and that he cannot count them all. And so, he is reminded that his trust and faith in God needs to be like this, even though he cannot see God or His plans for him, and he has been waiting a long time, his relationship with God tells him to trust in Him. Is there something in your life that you have been waiting for? Something that you have been praying for and have not yet felt any response? In our world, in this society, in this time, we are all very used to finding instant solutions to any problems and finding ways to make difficult situations go away. Think of that pain in your back – go to the chiropractor. Think of that new couch you want but can’t really afford – put it on credit. Think of the person you can’t face but really want to tell them something – text or email. We find a way to ease our discomfort, to keep things comfortable and easy in our life. And at times, we put the expectation of this type of quick “consumer exchange” on our prayers to God. We ask, and expect Him to provide, now. During the second week of our Rebuilt Book Club sessions, the participants were invited to reflect on the story of Abraham and Sarah, and how they not only needed to have faith and trust in God, but they also needed to fulfill their calling and take action to do all they could to follow His plan. We realize that sometimes we have to wait for God’s response to our need, and that in the waiting there is also some purpose. It might be for us to continue our growth, or preparation for the next step, it might be that there is another path that God will show us which is actually better for us. Abraham and Sarah’s story is a whole journey of faith, from having a little faith, to growing and trusting in faith. And having faith means acknowledging that we do have issues or problems in our lives, and reaching out for God’s help, and then acting in faith as if God’s word is true. Showing that we do believe He is with us, loves us, and He has a purpose for us and will guide us in our life. Living in faith, and truly growing in faith can be a challenge. We may wish and pray that people in our lives would come back to the church, or reconnect with their faith, and not realize that we can play a part in that. Thinking about actually doing something can really push us out of our comfort zone. According to the mission that Jesus left his church, we are his missionaries, and it is through our example of joyfully living our faith, that we will encourage and invite others. When we consider these people, we love who are not engaged in their faith or church, we can identify many. People at the book club shared that we could be reaching out to our families, our friends, neighbours, and co-workers. They also felt that there are groups who we should be giving special attention to support them in faith: parents of children in our Catholic schools, young adults, young families, people who are separated or divorced, employees in our Catholic schools, people who have fallen away from the church and those who may even come to church sometimes, but who are indifferent. When we consider how we might possibly be able to have any part in inviting someone else to come to church, or to engage in their faith, it may make us very uncomfortable. It may seem that we do not have the right words, or knowledge, or even the right heart to be extending that invitation. But if we are strong in our own faith, and feel its power and joy in our lives, and if we have faith and trust in God, then we can step forward to welcome others and speak from our own experience of how God has worked in our lives. Please consider the words of our Mission Prayer and keep it in your prayers as you consider what your role in God’s mission for the church might be. Can We Change Our Church Culture? The mission Jesus gave the apostles was to “go and make disciples” at the end of the Gospel of Matthew. If we believe the Bible, if we believe the teaching of Jesus, then this message is for everyone. Being a disciple of Christ means that we not only live our lives according to His teaching, but also in a way that shows others what it means to be a Christian. Do we have a culture of discipleship here at Holy Family? On the one hand we would have to say no, not yet, but on the other hand, we are moving in that direction, and it is possibly a continuous, never-ending journey. So when we speak about changing our culture, it is motivated by our deep conviction and belief that we are called to align our life in faith both personally and as a community with the mission Jesus gave us. To fully commit to this, sometimes it requires hard choices and challenging responses from us. Do we hold onto what we feel we are fairly entitled to? Or do we hear this mission and consider it as a personal call to embrace our responsibility to be part of God’s work here on earth – now at this time, at Holy Family in Whitby? Essentially, this is a question of whether we are a bystander or a member of the life of faith in the church. In the third segment of our Rebuilt book club, the video of Fr. Michael White’s homily (easily available on our website to watch) focused on this very question. He related the parable of the prodigal son in Luke 15. The crowd listening is made up of two groups of people, the Pharisees who would consider themselves the righteous, religious members, and the gentiles who have come to hear what this Jesus is teaching about, perhaps considered the bystanders. We all know the story, but perhaps not in the way that Fr. Michael tells it, explaining the context and the perspectives of these two audiences. It makes a difference, a very significant difference. The religious think not only that the behaviour of the prodigal son is scandalous, but also that Jesus telling this story is scandalous, and that the father should not have welcomed the son back. The gentiles…relate and feel like they ARE the prodigal son. And so the response of the father to be welcoming, loving and to actually celebrate the return of the son warms their hearts so that they want more of what this man is teaching. But this parable Jesus tells goes even further in the call to action of the “righteous, religious” people. This comes out in the indignation of the older son who has been a faithful and true son to his father. He questions why his father welcomes his brother back, but he challenges why he would go so far as to have an elaborate celebration of his return. Understanding the desire of the father, and of our Father in heaven, of just wanting all of his children to come home can help us understand the mission. But even more, it helps us understand the final piece of this parable, that it is our responsibility to do whatever we can to help welcome, invite and bring others back to God. There are many reasons that people are not engaged in faith, or not coming to church, we all know someone and their explanations. And they very likely do not consider themselves “lost” but have very clear and defined arguments for not participating. The people attending our book club sessions discussed many of these: giving up the time to come to church; the schedules of weekend family, children and sports activities; not feeling the church has any relevance or anything to offer them in their lives; past negative experiences with a church community or even specific people; disputes with the structure and teaching of the church; the hypocrisy of scandals in the church; a feeling of personal “spirituality” that they feel doesn’t require them to come to celebrate Mass. There are many more. Through the small table discussions, our participants also generated many ideas and insights into specific ways we can focus our efforts to engage particularly young families, the youth and children. And all of the suggestions were founded on a personal relationship and understanding of these people and what would genuinely encourage them to come to church. And in sharing their reflections of people they know personally who are “away from the church”, it inspired a personal awareness and call to action about what each person can do to be part of the mission of Jesus to make disciples. The remarkable thing we are learning is that in taking this responsibility and reaching out to others in faith, we become disciples. This is not easy work, it is hard, and it is not just about a change of culture in the church, it is about life changes for each of us. And that is the challenge. Can we support each other in becoming disciples, followers of Christ, who not only welcome the person we know and love who has wandered away, but like Jesus, can we embrace and love the person we don’t even know…yet? Where Is God Calling Me To Serve? In working to become disciples, in building up the church as Jesus commanded us, this fourth week of the book club looked at two ways that we do this: in ministry and mission. Working in ministry is service that we give inside the church, to one another. Mission is the service that we give outside the church, to the world. Both are manifestations of our faith in action, for we know that “…faith without works is dead.” (James 2:26) So to live our faith fully, we need to take it into actions that demonstrate our belief in the teaching and example of Jesus. In the video for this fourth session, we heard Fr. Michael White share the Exodus account of the story of Moses, in particular his encounter with the presence of God in the flaming bush (Exodus 3: 1, 2-4). God tells Moses to remove his shoes as he is standing on holy ground, and then tells him that he needs to be the one to go to Pharaoh to request the release of His people, the Israelites who are captives in slavery. As He always does, God will lead us, if we are open to His direction, but He needs our help here on earth. The response of Moses was pretty typical of all of us being asked to step forward and take on an arduous task: “get someone else”. Like Moses who gave God many arguments why he was not the person for the job, we all have many excuses and reasons for not serving. Foundational to our response is our attitude – one that is open or closed. What is sometimes difficult to remember is that while there will always be a need for volunteers in the church, what is more critical is our need to serve. Through the small table discussions at the book club this week, participants identified many challenges for people to become involved in various ways of building community in the church. First and foremost, and mentioned repeatedly of course, is the lack of time. Our lives are very busy, and unless we are dedicated and committed to giving time to our faith, it will not happen. No one said that living our faith would be easy, nothing that is important to our lives ever is. But when we live by our conviction of what is right, we are better able to journey along the path step by step to accomplish what needs to be done. When individuals truly feel that they belong to the community of faith at the church, they naturally take on responsibilities to support the parish. In taking ownership and realizing that they have a role in maintaining and building the programs and relationships in the church, people step forward, comfortably and happily to serve. We have seen wonderful recent evidence of this in the parishioners who jump in and hold the door to welcome people when they see that the usual “greeter” isn’t there. Or when someone drops off some home baking or (nut-free) cookies to be used for our hospitality after Masses and others who help with clean up or pouring coffee. Or when someone coming through the parking lot assists the young parent trying to safely walk a toddler and carry an infant into the church. These actions are by no means new to the people of Holy Family, but they are very real examples of being intentional about how we all share in the welcoming and building of our church community. This also translates to our financial responsibilities for the church – if we feel it is our church, then we want to make sure it is sustained. When the book club participants thought about what seems to inspire others to join serving in ministries in the church, they often mentioned the visible joy of people in ministry and that they obviously enjoy what they do. It stands to reason that people who have a clear understanding of what is expected, are well-matched to a task, feel properly trained or equipped, and are part of a strong team will demonstrate contentment in what they do and draw others in. This is one of the main objectives of the process we are undertaking through the book club, to help engage parishioners through discernment and prayer in finding their talents and strengths and connecting them with others in a role in the church that they are well-suited for. The final piece the book club explored was the idea of work in missions, service outside of the church. There are many charitable organizations around of course, and teams from Holy Family are connected with a number of them, such as the Society of St. Vincent de Paul, our Homeless Mission which serves at Gate 3:16, St. Vincent Palotti’s kitchen and others. An aspect of serving in both ministry and mission that became very clear from the conversations was that sometimes uncertainty about serving comes from a lack of information about what is available, and what is expected. There will be more information coming soon about all of our ministries and missions and about our Next STEPS approach to finding ways to grow and develop in our own personal faith, how to connect our talents and time to service in ministry and mission, and to learning about what is available. The call from God to Moses to overcome his feeling that there should be someone else to do the job, isn’t just for Moses, it is for everyone. If we pursue a discipleship path of faith, then we will grow as disciples through our service. The church will then also grow through our works of faith in ministry and mission – and that is the church that Christ wants. So, should God get someone else for the work of the church? Or is He calling you? Over the past weeks you have been hearing a lot about the Rebuilt Book Club that we have had at Holy Family, both in the homilies at Masses and in the bulletin. There is also a page on our new website (holyfamilywhitby.ca) dedicated to all of the resources and materials for the book club. (So please feel free to take a look at the session outlines and the videos of Fr. Michael White.) You might wonder why we have gone to such lengths to make this all so available to the whole parish. While we had over 400 people take a copy of the “Rebuilt” book, and over 300 who were able to participate in the actual sessions, what has become very clear is that the message of how to grow in faith in order to support our mission is for all parishioners of Holy Family. But even more importantly, we believe that this path of faith is what God wants for all of us. Our mission of “love God, love others, make disciples” is biblical, it is based on the word of God through the scripture of the greatest of the ten commandments explained by Jesus, and the great commission that He gave to his apostles. And so, it follows that in trying to determine how we can take actions, make choices and decisions in our lives to embrace this mission, and even grow in faith to actively support its execution, we can turn to scripture. When we read the bible and listen carefully, it does have the messages needed to inspire us, even in our lives and this world today. We have now launched our carefully and prayerfully prepared “NextSTEPS” booklet which is available to all parishioners to use as a way to consider where we each are on our faith journey, and what we might possibly do to take some steps of growth. There is no specific sequence to the steps, no giant actions required, and no set timeline – what is important is that we try to do something. Even one, single small step taken when we are able, is a step in the right direction. And, we have seen again and again, how even the smallest action humbly taken by a sincere believer with faith in their heart, can have a huge impact on the family of God. But let’s be clear that the steps of discipleship are not to be taken out of a sense of obligation, that is not what Jesus asked, he did not even use the word. But discipleship is based on a relationship with Jesus so that when we hear Him invite us to “follow me” (Matthew 4:19) we do so out of love. For many people, the idea of movement forward or of growth is a challenge when they do not know where they are going, or what is expected. That is true of many things in life, we may know the destination of a trip for example, but if we have no idea about how we are getting there, where we will stay, who we will see, or what is expected of us, it makes us very uneasy, and the journey more difficult than it needs to be. Within the context of our modern world, and the fast-paced busy lives that we have, we need to feel that we are able to maximize our efforts for a worthwhile purpose. It is our hope that the NextSTEPS booklet will give you what Fr. László has been calling a “GPS for growing in faith”, both in the direction and purpose of taking the journey. The five parts of this journey of faith are identified by the acronym “STEPS”, and each has a biblical foundation. The first “S” is to “Serve in Ministry”, and we know service is essential to our growth as followers of Jesus Christ. “For even the Son of Man came not to be served, but to serve.” (Mark 10:45) There are many varied opportunities to be able to use the gifts God has given us in ways that will serve His people and His church. Over the next weeks, you will hear the homily messages explore and explain more about each of these steps for your own possible journey of growth in faith. Please take a copy of the booklet and bring it each week with you to Mass so that you may make notes, reflect, pray, and consider where you are in your faith life, and what steps might be next for you. Please know that through our Mission Prayer, everyone is in our intentions, and that we are here to support your journey in any way that we can. God invites all of us to follow His son, Jesus. Do you know where you are going, how to get there and are you ready? Are you on the lookout for something new from God? We have now reached the conclusion of our book club based on the Rebuilt story of the Catholic Church of the Nativity in Baltimore Maryland. For six weeks, people gathered to reflect on the book, watch videos of the authors, Pastor Fr. Michael White and his associate Tom Corcoran, and discuss how any of this can apply to or help us here with our mission at Holy Family in Whitby. All of the materials and resources are available on the Rebuilt page of our new website, so please feel free to explore it to see what it was all about. The book club may be over, but here’s the main point, our work is not, we do not end here. Rather, we now move into the next phase of our action in faith to fulfill our mission to: “love God, love others, make disciples”. And we do so not only with deeper understanding of what that mission means and what God is calling us to do from a spiritual perspective, but also with awareness and appreciation of the practical aspects of how to take these steps personally and collectively. We can learn from the experiences of the Church of the Nativity, but our experiences here will be different. 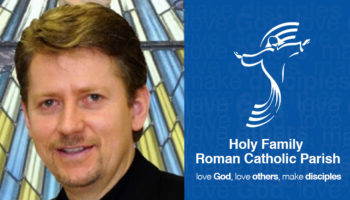 From the outset, it was our vision to bring parishioners into the conversation to first help us fully understand our context here in Whitby, and second to discern how we can apply what we have learned to help us grow as disciples and build our real community and family of faith at Holy Family. In the final video for his “Rebuilt” homily series, Fr. Michael used the scripture from Isaiah 43 in talking about God’s people hoping for their temple to be rebuilt, but being unsure of how to do it, where to start, and while being hopeful in faith, still feeling overwhelmed. The message in Isaiah is of course for the people to continue to depend on God and live their lives as He commands, but now to also look for God to do something new. This does not mean God is changing, our faith teaches us that scripture, what we know of God, and the Eucharist do not change – this is the orthodoxy of what we believe. But in our modern world, there are things that can change in dynamic ways with relation to our church. This creates a tension of “dynamic orthodoxy”: firmly rooted in the orthodoxy of our faith, we can be dynamic in our approach, eagerness and creativity about how we connect and deliver the message. Pope Francis, for example, has himself in Laudato Si embraced the possibilities of using our digital technology for the good of communicating and sharing the faith, and serving the environmental issues of being stewards of our earth. Over the past few weeks, we have been asking ourselves some key questions to help us come to understand more clearly a few aspects of how we can live out our parish mission in real ways. When we consider what our “why” is, we can motivate ourselves to engage in church to deepen our own faith, but also to help bring others into a closer relationship with God and faith. When we are trying to take steps forward, we ask ourselves if we are truly relying on and trusting God. The going might get tough, and if it does, are we ready to put our faith in His plan for us and stay the course? If we are to be true to what our mission means, and set out to make disciples, we need to consider how this impacts the culture of our church. Of course, it first means that we need to work on being disciples ourselves, and then work to support an environment and community that welcomes and invites others to become members. One of the steps we can take to become disciples is through service. The difficulty here is to first of all know our gifts and strengths and then to find a way that we can offer our time in a ministry or mission that matches our talents and our busy schedules. (To help with this, we now have a link on the service page of our website that takes you to a charism questionnaire that you may complete to discover your own special gifts.) Once we determine if we are ready to serve in the church, there are a variety of ways to do this. Our NextSTEPS booklet was designed to be the tool to help you with this. Make a copy of it your own, and let it help guide you on your faith journey. And now, finally, if we have discerned, if we have prayerfully opened ourselves to the idea that God can and will work through us as members of the body of His church to build it up, are we now on the lookout for the new things He will do in our lives and in the community of Holy Family? We might feel anxious about challenges ahead, we might feel excited about opportunities, we might feel inspired by the faith stories of others, but we should also feel joined together in a caring community that believes that we can do this! We have been truly privileged to participate in this book club with so many wonderful people, and we look forward to the amazing things God has planned and will bring us to do here at Holy Family. Thank you for your interest, support, and prayers to make this a truly faith-filled and loving parish on a mission to love God, love others, and make disciples. are meant to be. May you not forget the infinite possibilities that are born of faith. given to you. May you be content knowing you are a child of God. dance, praise and love. It is there for each and every one of us. Amen. Joining the book club and reading Rebuilt are proof that you love your parish and that you are here to make a difference, to change the culture and embrace the New Evangelization. Read our parishioners' testimonies and see the difference this book made in their lives. I am Tess Bondoc, and I'm here to invite all of you to join us and be part of the Rebuilt Book Club. This book is a story about how Nativity Parish transformed to a missional parish and how they changed the culture. To me it’s not just a story about a church but also about the people of Baltimore, their parishioners. It's about how they learned to be more involved and engaged in the parish; and how each individual transformed himself and took a leap of faith. It's also a story of hope, that with the Holy Spirit and God as the main focus, nothing is impossible. This book will help us to do something, to get out of our pews get involved and be inspired to evangelize. It's a journey that we are inviting you to be a part of.